The driver of this progression is technology, and as an Eco world advances in technology their ability to impact the world increases massively, for better or for worse. With each advance in technology, you gain the ability to do everything you already do in greater quantities. And with each step in technology, the challenges become greater, making those powers very necessary to continue advancing. This manifests in gameplay in the following ways. Gathering resources becomes faster. Your tools get more powerful and you can gather more. New resource types are unlocked like oil. You move from handheld manual tools to powerful machines and vehicles that gather for you. From axe to chainsaw, from shovel to excavator. By the end of the game you have the ability - and need - to move mountains of material. Massive quantities of materials will be needed for end game content, and you will have the ability to gather that. The impact it has on your environment will be equally as massive. Transport becomes more powerful. 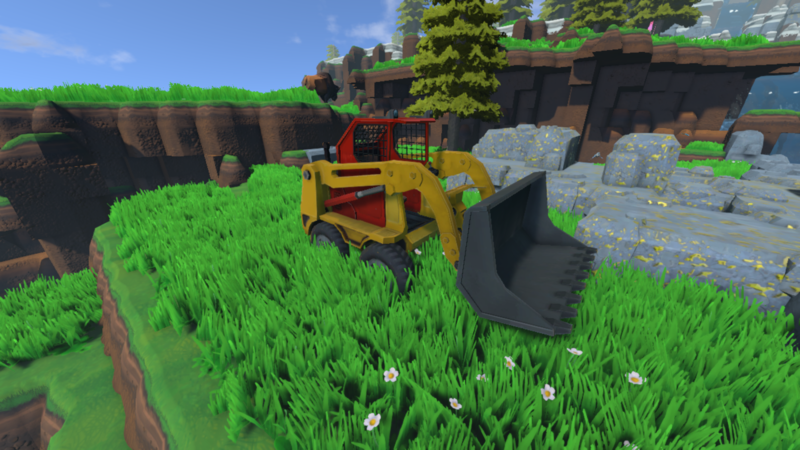 At the beginning you’re moving things by hand, and slowly you gain abilities to transform your world to make moving larger quantities of materials faster and more efficiently. What once were local villages (where trade happened only within them) become global networks connected by roads (and eventually, rails). The world becomes smaller, you’re no longer limited to your immediate area, and the world begins to be shaped by the infrastructure build to move resources around it. 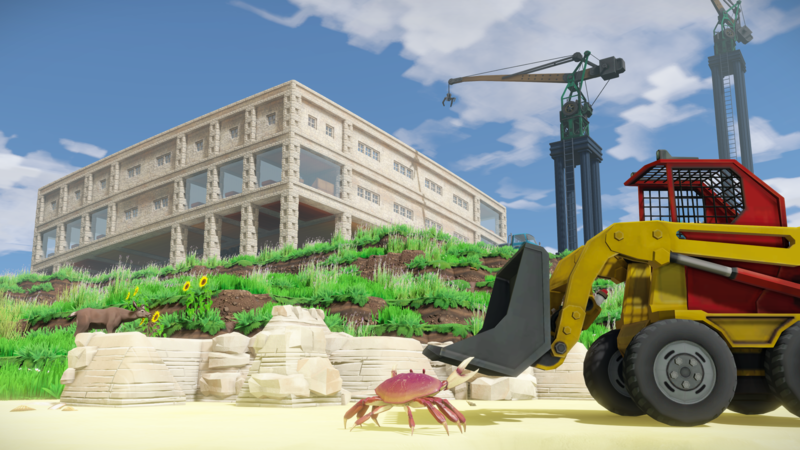 Building can be performed in bulk, with new construction equipment like the crane, and the ability to transport materials easily to new places with infrastructure. Soon the habitats and industry and commerce of humans are displacing the natural environments that once thrived there, and the byproducts of that growth can affect the surrounding areas in significant ways. We’ve got the broad-strokes for the technology arc already, but it’s something we’re continuing to build through early access. 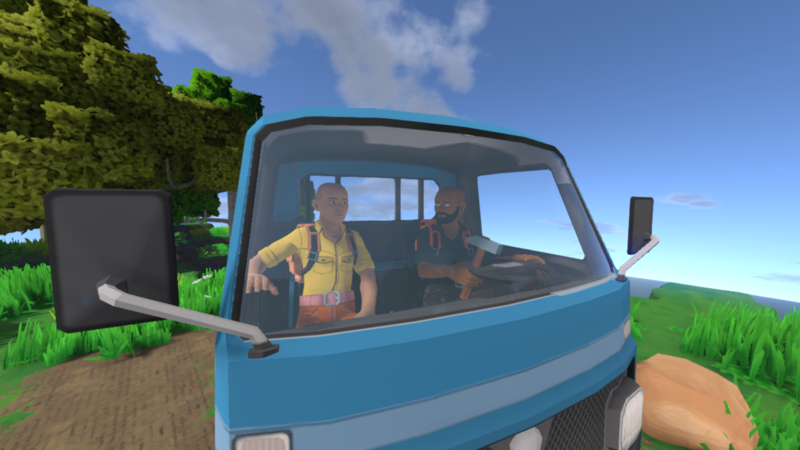 Vehicles are a huge part of this, and with 8.2 we’re tuning up the use of the existing vehicles, and in future updates we will be adding more and making them more useful and flexible. This growth in power will put enormous pressure on the ecosystem, and thus follows the purpose of the government, to regulate and decide as a group how those powers should be used. As your powers grow, so must your regulations, ideally leading that progress rather than playing catch-up, but that is not so easy. Government, then, is a tool to manage the powers you are gaining as a society and keep them pointed towards sustainable growth. Thus, there is an arc of government that mirrors the arc of progress: from free-reign at the beginning of the game when powers are meek, to complex regulations when powers are extensive. Going through this whole process should be an illuminating experience, and different every time, with tons of potential problems coming up that you’ll need to solve as a group. With our 9.0 government upgrades, the ability to do this will become much more flexible and powerful. We’ll need the community’s help with this as well. When we get the 9.0 test server up we’ll need lots of feedback. And ideas you can submit to our suggestion database here. So many great ideas come from the community, and developing it in tandem with them has been a great experience. We also have a dev tier available on our website[accounts.strangeloopgames.com] for those that want to dig into the code. Hey all, for this Friday’s Eco Peak I wanted to talk about the new government system I’m working on for Eco 9.0. The high-level idea is that in the current version of Eco you run a government. In 9.0, you will build a government. First thing you’ll need to do to create a government is form a constitution, which will be an object placed in the world. The value of the building it’s placed in will determine how much influence the government has, and whichever government has the most influence will dictate the rules for the world. This means that governments can be overthrown by making a more powerful one, represented by a more valuable building, and players will need to create fantastic palaces to ensure the legitimacy of their government and prevent being overtaken. (Later, we will allow multiple governments to co-exist and compete, but for now there can Be Only One). I wanted to add the ability to overthrow a government because it fits thematically – if a government no longer represents the will of the people, there is a way to overthrow it and start a new one. 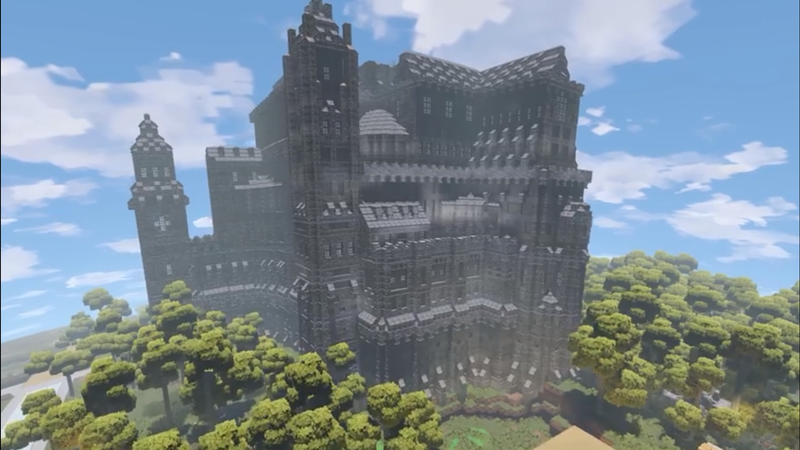 This is costly, as it should be, as a second palace will need to be built that exceeds the first in strength, which is difficult to do without the support of a lot of players. Once a constitution is built, you can start adding Civics Objects to add features to it. A Constitution does nothing by itself, but once you add a ‘Court’ you can create laws, and once you add a ‘Census Bureau’ you can create demographics, an ‘Election Hall’ to allow elections, ‘Parliament Office’ to add an elected position, a ‘Bill of Rights’ to add constitutional amendments, and lots more. This way your government grows in pieces, and the selection of things you can do with it grows slowly, allowing players to dictate what kind of control they want in their world, and not overwhelming them with infinite options from the get-go. Furthermore, the different options within those categories can be extended as well. So if you add a Lumber Licensing Office, you augment a court with the ability to create laws about logging. Additional modules can be plugged into these government objects to expand their abilities. I’ve set a personal goal for myself this year to ‘make creating tax code fun and interesting and straight-forward’. Basically take something many people think of as one of the most boring things in the world and making it exciting and interesting. The key to doing this is to make it relevant to things that are interesting to you, IE how your Eco world functions. You can see there are lots of options available everywhere, but the simple things are still easy to do. If you want a very basic cause-and-effect law (when people chop down a tree, tax them), you can easily slot that in to the ‘cause’ and ‘effect’ lists by just picking from dropdowns. If however you want something much more complex, you can do that too by displaying the Advanced Properties in these options and plugging in different values into the different fields. In the above case are three logging-related causes that lead to a conditional effect: if the user is high-skilled, they can perform the action without even needing authorization. If they’re not, then they pay a tax related to the population percent of the species in the world. We’re still working on this, the icons aren’t in yet and we have some more things to do to simplify it, and it'll be something we continue to expand and grow for all kinds of possibilities (think mortgages, contracts, rental agreements, ad infinitum). It will be the foundation of all kinds of complex civics and economic experiences you can create in the game, with the goal of making them all both simple and powerful, with lots of help text guiding you along the way. These are all values that you can slot into other parts of the law, letting you make very generic laws that depends on what kind of trigger happened. It’s like programming in a way, with to-the-moon intellisense turned on to prompt you at each step. Also since this is all generically created, it’s incredibly moddable. Every piece of it can be modded and extended easily, opening the door to lots of intricate government structures. Can’t wait to see the brilliant and crazy stuff that players build with this. 9.0 is still a few months out, and we’re currently staying focused on polish and performance for 8.2, but following that we hope to roll out 9.0 not long after. Eco was born out of the core idea of ‘Tragedy of the Commons: The Game’ where all your resources come from the ecosystem, and all economic and governmental actions happen through real people. That’s a huge, seemingly impossibly scoped game, and I believe we’ve made incredible progress. The above screenshot comparison (between our Kickstarter and today) is crazy to look at. 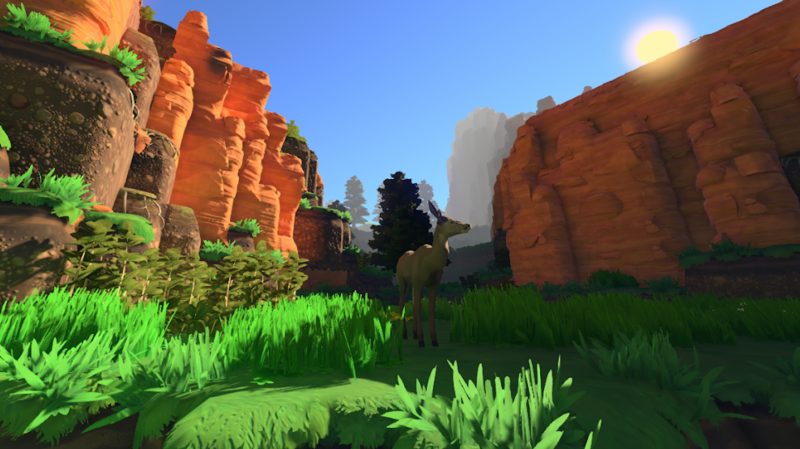 We’ve been working on the game nonstop since 2015, and it’s improved continuously, incrementally, until it looks like a totally different game. 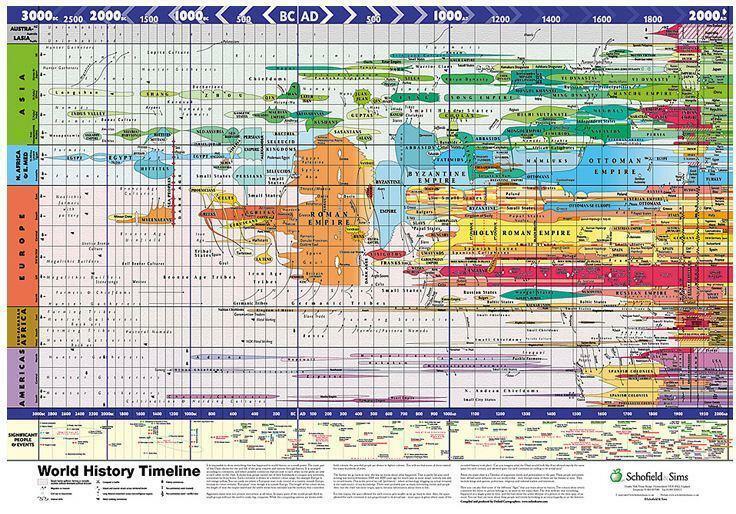 Through that, the core idea has remained constant: a society simulator inside an ecosystem. With the strength of the team and the community that has supported us throughout we’ve been able to do some really fantastic things, and we have much more we want to do. A focus on the legal system, with the addition of a constitution players create, and much richer law and tax support for v9.0. We want Eco to be an incubator for social experiments, with enough richness that some very deep, sophisticated scenarios can emerge fully from the governmental and economical designs of the players. Ecosystem enhancements, making deeper pollution mechanics and ecological systems, and the need for joint large-scale projects for v10.0. We want to continue building out the depth of the simulation, and doing so in a way that everything is visible and accessible to players, and can be used to make decisions about the world. Further economy enhancements, that will tie to the government as well. Building residency, a rental market, mortgages, equity markets, stocks, all kinds of financial instruments. This opens the door for more complex government features like location-based representatives, laws on interest rates, central banks, etc. Managing a thriving economy and government should be one of the main challenges of the game, and that should be a very challenging and interesting thing to do. We plan to continue extending our mod support, which we see as critical to long-term replayability, and the potential to create total-conversions of the game. We’ll introduce more mechanical-type objects like switches and tolls, which will let players create some pretty interesting creations. The law and economy systems will be fully moddable, one of our most unique features, creating the possibility for modded games that do really unique and interesting things with player governments and economies. We fully intend the Eco engine to be a platform, both for future games we make, and modded experiences that the community creates. Release won’t mark the end of Eco development, not by a long shot. Eco is a forever-game for us, as long as we have the community’s support, and we intend to continue increasing the depth and reach of the simulations indefinitely. There’s really no limit to how much depth we can put in the game, and there are tons of areas we’d like to explore: geological change, evolution, health systems, flying vehicles, you name it. This stuff is still far out so it hasn’t been planned, but we’re taking our time building out the tech right so it can support it. The game may radically change over time (as it changed in the last three years that you can see above), but the core will remain the same: a society simulator in an ecosystem. Within those confines there are infinite avenues to expand, and I expect we’ll never run out of systems to expand and make deeper, connecting each to the other so it remains a whole and cohesive package, not just a collection of features. It’s an illustration of how much depth we want to add to the simulation, and a vision to lead us there. At the same time, we will keep improving the engine we run, expanding the size of worlds and how many players they can support at once. We’ll be looking at connecting multiple servers for a single world, so the capability to host massively populated worlds becomes possible. 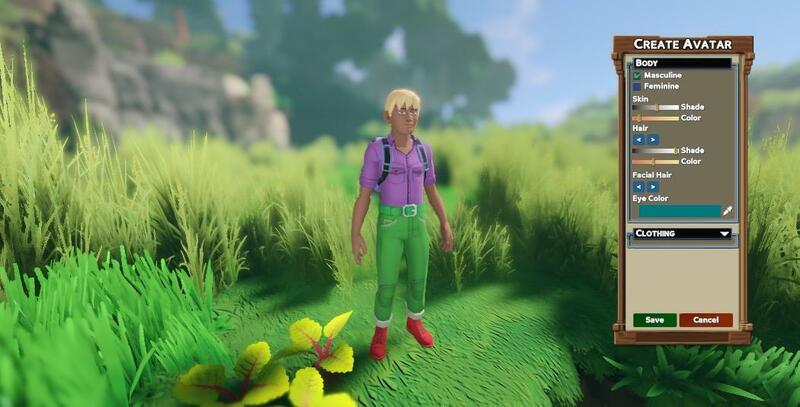 The current plan is that all future games we create, after Eco’s 1.0 release, will be built in Eco’s engine, and be connected to Eco, meaning you can travel between Eco and the future worlds that we will create. With multiple games sharing the same technology, we can really invest in and continue building it, with each new game will come engine improvements that affect all previous games. We already have some prototypes of new games, but we’re still focusing on building out Eco to its full potential before we start scaling them up, but can’t wait to share them with you. Long term, I see the future of Strange Loop as building out a universe of connected games, each connected to the others and allowing players to move between them, build on the common platform of the Eco tech, with each game being connected to education subjects, simulation focused, and highly collaborative with real players forming institutions. 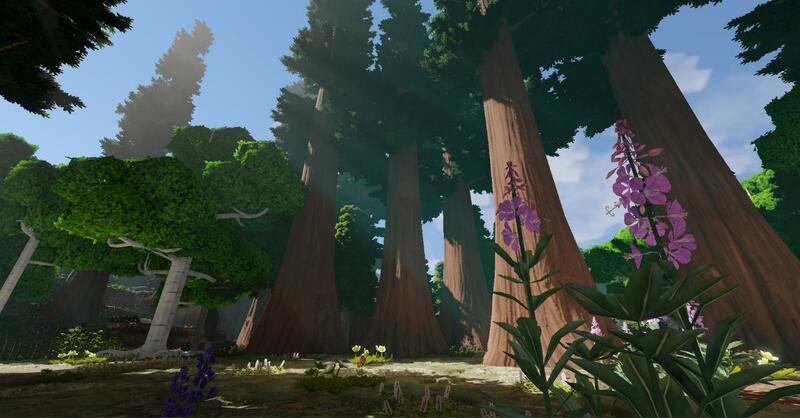 All of these plans for Eco also fit into another more subtle (but loftier goal) of our work here, and that is to change the dynamic of how we play and learn in virtual worlds. With Eco we are creating a game where the conflicts and struggles you face are unique in that they are not violent ones. That is a topic that has been explored endlessly in games, while there are vast landscapes of unexplored possibilities lying at our feet: conflicts that arise from cases of competing economies, government philosophies, and human greed. Violence is really the least interesting conflict in the mix there, and well-covered by other games. I want to create a game where players need to save the world not from an alien threat but a financial crisis that threatens to collapse the world’s food supply, by player-run corporations that twist regulations into their favor with political influence and destroy the biosphere for profit, by well-meaning individuals acting in their own self-interest, unable to see the destructive biases they possess. These are much deeper and more complex problems to solve, and it is now in the realm of video games to let player solve them, with real people, in worlds running complex simulations. The tools that you use to solve these problems are not guns, but scientific analysis and debate, economic growth, taxes and regulation, leadership and collaboration. These are your ‘weapons’ in the game, and your foes are rarely ‘villains’, but well-meaning people like you, carrying opposites views and biases, whose resolution you must find to succeed. The world in video games is often extremely black-and-white: good vs evil, good guys saving the world from bad guys. We aim to create games that exist in a much more complex world, illustrating how even people with the same urgent interests and goals (like a meteor incoming), can fall into conflict, and just as in the real-world, simplifying that problem into good-vs-evil is not sufficient. I firmly believe that the character of our virtual worlds is going to matter immensely over the coming decades, as they become more and more merged with regular life, and we spend more and more time in them. Indeed, I believe they represent our future as a species, and their character thus far has been excruciatingly focused on violence. I don’t believe that is our decided destiny, we can choose to create another option. There are much more interesting worlds for us to occupy, that let us achieve higher ideals. With our little project here, we hope to create a demonstration of that, and to grow that idea. And most of all, to welcome in supporters of that movement, the players, who are also the contributors. Taking this approach to our games opens up a huge opportunity: applying games to education. I believe the education system, especially in America, is in vast need when it comes to preparing students for the future. It’s saddled to an outdated system training students for an era that no longer exists in the present, let alone for the future they will enter. Specifically, education still focuses primarily on the acquisition and demonstration of knowledge, but we live in a world where knowledge is ubiquitous: anyone can learn virtually anything they want from anywhere. The more valuable role of education is inspiration, context, application, meaning. Giving you reason to care, and a community to care with. While there are many incredibly passionate teachers who understand and give this to their students, the underlying educational system doesn’t value that, instead relying on the pressure of tests to ensure learning, upon which their future success rests. Enter video games, which are the opposite: they are motivation-machines, shared worlds of achievement where players are inspired and self-driven. Unlike homework, game players do not need to be compelled to play a game with external consequences, games are their own motivation. They are natural use-cases of the ‘Four C’s’ of what’s needed in contemporary education: Critical thinking, Creativity, Collaboration, and Communication. I believe the integration of games into education is a major part of the answer to the problems education faces. Games answer the question of ‘why do I need to learn this’, by providing shared, collaborative worlds where the skills they learn are needed to succeed. Rather than providing raw knowledge, they provide a need for that knowledge, and the resources the existing education system provides them to retrieve it (teachers, books, the internet) suddenly become essential and relevant to their lives, and thus interesting and desired. Knowledge is infinitely more useful to person when it is pulled than when it is pushed. And so with Eco and our future titles we aim to provide this platform for education. This year we are focusing on building extensions to the game that make it work seamlessly in a classroom, taking care of hosting, billing, world management, curriculum generation, teacher dashboards, and more. We will begin pilot testing of this later this year, and will be calling on our community to help find teachers who can join us in this project. We believe this will provide a needed and underserved value to the education system, with the potential over the long term to start changing ideas about how we prepare students for the future. And that’s where the community comes in, as supporters of this movement and new approach to education, we can’t do it without you. The support we have received from our growing community thus far has been phenomenal, and we’re just at the beginning. If we succeed, it will be because of those that supported us from the beginning, and saw the potential and far reaching impact that can come from games with purpose. It’s going to be a busy year for us at Strange Loop, and it’s great to have you along for the ride with us. Fixed elevators to be usable again. Fixed allocate and tax in the treasury. Mint now performs a single check and single action record per Mint operation (previously it was for every single item in request, for 1000 items - 1000 checks and inserts). It greatly improves Mint speed if Mint limiting law is active and also reduces DB size (in any case). Changed logic of Mint operation. Now it completely aborts Mint operation if you don't pass a law instead of partially execute it (i.e. you have limit of 100 items per day, minted 50 items and try another 100. Old behavior: 50 will be minted + error message. New behavior: operation rejected + error message with corresponding law statement). To prevent extra queries law statement logic changed. Now it counts Mint actions before user action, but also added Current Action Count numeric value. So you can rewrite law as current action count + mint actions count < 101 to have the same effect. Actually buy and sell actions already worked this way, so it brings Mint action in line. Also now you can use Current Action Count with Buy and Sell actions. * Added new GI quality setting levels. * Compost now has a tooltip in the water filter UI. * Trashed compostables will now turn into compost. * Pickaxes now work on a damage system rather than a strict tier system. Repeatedly hitting harder rocks will eventually destroy them. * The water pump was split into a mechanical and electrical version. * Waste Filters that shut down due to full inventories will now restart themselves if there is more inventory space available. * Tree trunks now give some wood pulp when destroyed. * Most non-progress blocking recipes have had their skill level requirements returned. This includes objects like beds, chairs, some light sources, etc. * Made Character XP tooltip more clear. * "Your currency" law clause now counts all funds on all accounts! * Fixed "Your Currency" counting in laws and law taxing account pickup. Now it accepts only managed/created by you accounts except special ones, like treasury, etc. * Web map now starts paused at the current server time, switching layers while in this state is much more responsive. * Optimized rubble even more. * Replaced the "ExperiencePerAction" option on the server with a "PlayerExperiencePerSpecialtyExperience" option which grants experience for overall levels when players gain specialty experience. As with the previous option, this is not intended for normal use. This update includes parts of the planned performance fixed for Update 8.1. Fixed zero tax display in transfer UI. "Your currency" law clause now counts all funds on all accounts! Fixed issue with non-withdrawing funds during trade when total tax (seller + buyer) is greater than buyer funds. 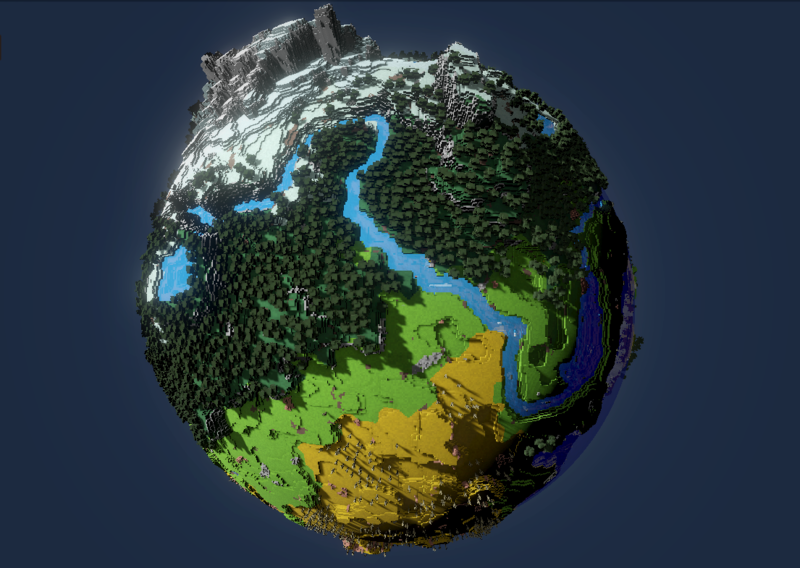 World generation has undergone a variety of changes and improvements. 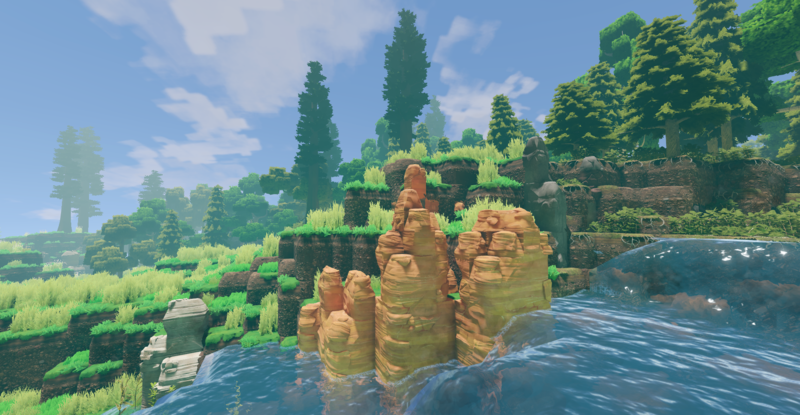 Many new parameters have been added to world generation, such as land/water balance, number of continents and islands, sizes of biomes, and number of water features such as rivers and lakes. All of these parameters may be tweaked within the world generator config file. 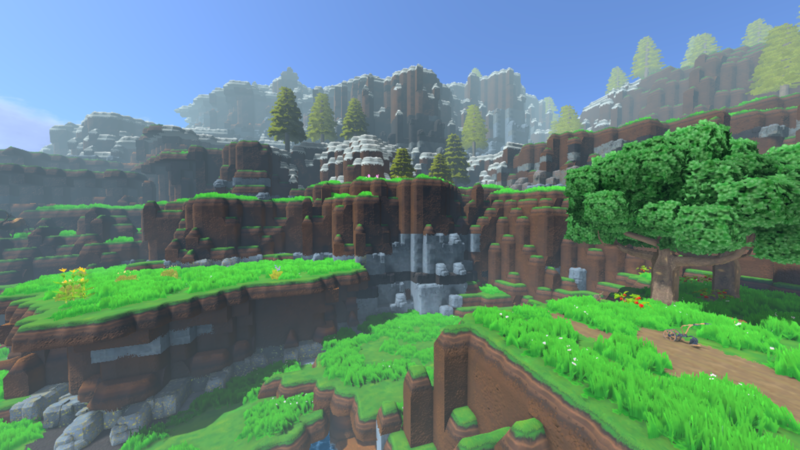 As a result, worlds are much more varied with specific resources only being made available within specific biomes. I addition, we have reworked the world geology, by adding an assortment of rock types like Sandstone, Granite, Shale, and Limestone. 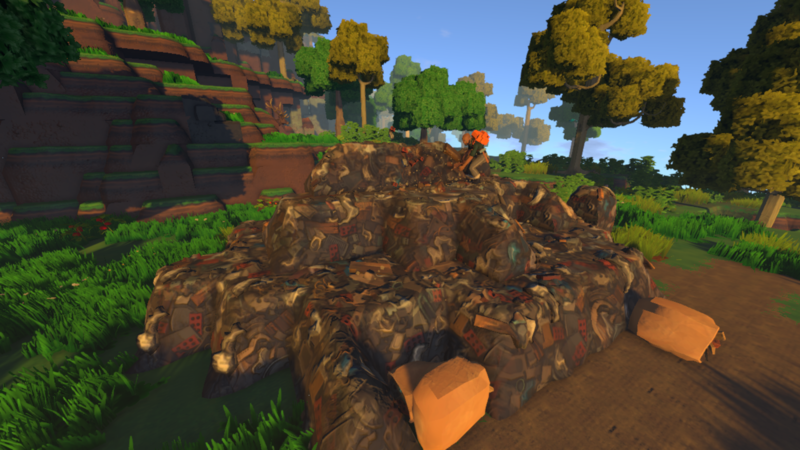 Certain rock types appear only in specific biomes and at specific depths. These rocks all have different uses in recipes and can be made into unique looking mortared stones. Ores like Iron, Copper, and Gold are now located in specific host rocks which will encourage you to choose the place of your settlement wisely. Lakes have been added, and the river generator has been rewritten to have an improved look and feel to them. The skill system has been simplified and reworked to encourage active engagement. While specializations will still be based on the same time-gated model as before, you no longer need to choose between improving your current specialties and gaining new ones. Instead of having multiple skills under specialties that all need skillpoints to advance, we've rolled all those benefits into an action-based leveling system. For example, players who choose to take the hewing specialty will be able to hew logs with increasing efficiency and speed as they complete orders rather than being forced to wait on skillpoints to achieve maximum efficiency. The second major change is that the vast majority of recipes are now available without taking the related specialization at a drastically increased cost. This should allow players to experience parts of the game they would have previously been locked out of while still giving players an immediate and powerful benefit for choosing specializations. In addition to more generic benefits for a specialization, player will occasionally be able to choose specialization-specific talents upon leveling up. Talents for a given specialty are mutually exclusive: if you take one you lock yourself out of the other. Do you want to destroy the forest faster or do you want to be able to clean up the debris you leave behind easier? The goal is to encourage you to pick talents that benefit the way you want to play the game. Even with the new changes, don't neglect your diet or house! What used to be skillpoints/day has been changed to an experience multiplier that is applied in two places: the rate at which you gain new specialties and the rate at which those individual specialties level up. We have implemented banks to allow you to create additional bank accounts that you can share with other players. You can set who has access to the account and who is allowed to manage it, which will make playing together easier and also allows the world leader to grant other players access to the treasury. Everywhere where you need to pay with currency you can choose from which bank account you want to make the payment. Of course, you can also set into which bank account payments should go. And to make your life easier, we added the possibility to transfer money to different players and bank accounts just by clicking a button. Registrars enable you to create titles that you can grant to other players. Those titles can then be used in any authorization UIs and in the law system which allows you to easily group players or create titles for people that you want to work for the government. The AI of animals has been greatly improved and exposed for modding. Animals now eat, sleep, form packs and have species-specific behaviors. Beware though, as they became more intelligent and will now notice when your arrow hits just besides them. We have also implemented a headshot mechanic to make your life easier. In Update 8.0 several workbenches need to be supplied with water to function. 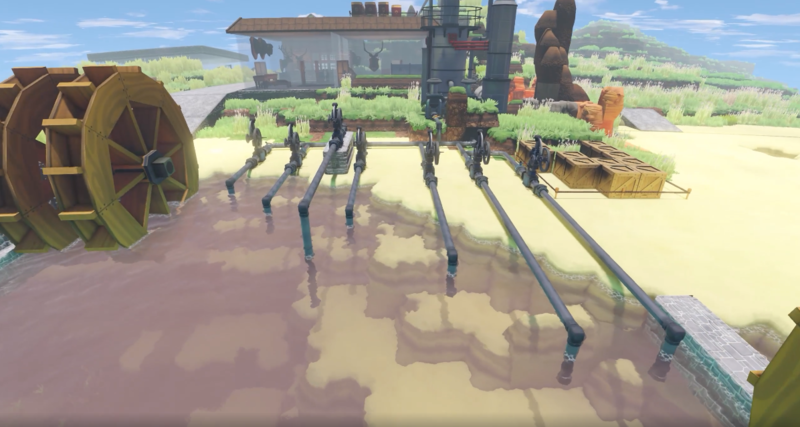 In order to do so, you craft a pump and place it near a water source, connect it with pipes and deliver the water to the crafting table where it is converted into sewage. 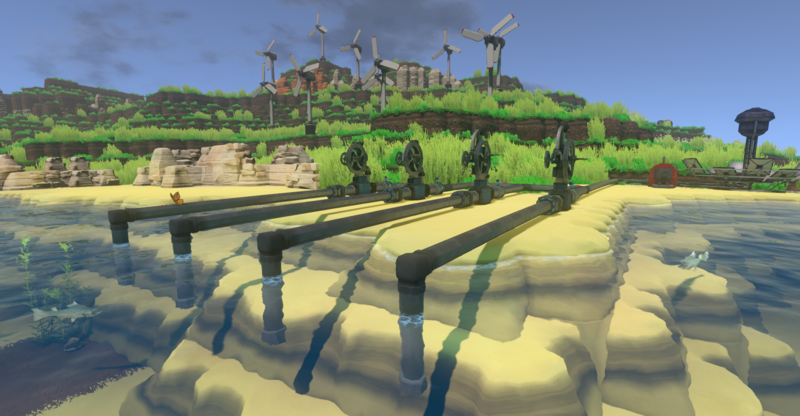 The sewage then needs to be taken care of – in the early game your only option is to release it into the environment, harming it. Later in the game you will get access to the water filter which allows you to clean the sewage and create compost blocks out of it which make a good ingredient for fertilizers. Added UPnP support for the game server. Added the ability to customize the reputation colors. Added an API for viewing and setting server configs. enough to minimize data loss. The behavior of backups is now more predictable and works correctly for all settings. Added Disconnect from game when entering another lobby, allowing to join a different server is the player is already in game. Added Arabic and Vietnamese language support. The physical behavior of falling objects has been improved. Animations for jumping players and network interpolation have been improved. Updated the meteor intro sequence. All tutorials can now be reviewed in the “tutorial” tab, left clicking an tutorial there will show it’s popup. Language names in the language selection in the menu now show in their respective language. Added pathfinding functions to allow movement between land and water and quickly finding paths back to water for amphibious animals. Most animals now attempt to return to their home area so visible populations should be more similar to the world layer displays. Added basic herd/pack behavior to some animal species. 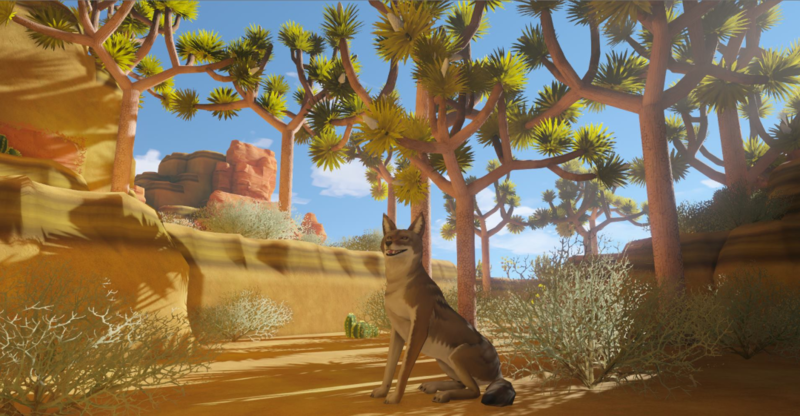 Moved animal movement behaviors to mods to give modders some examples of how to work with animals. Otters can now venture inland and float with their glorious tummies on display. Tree felling now scares nearby animals. Updated predator behaviors to show eating prey, hunting, relaxing and sleeping. Animal will now flee hunting predators. 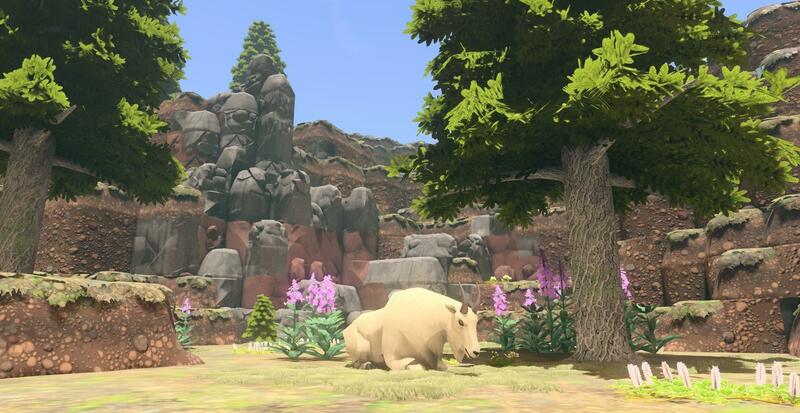 You can now get closer to animals if you move slow or avoid moving directly towards them. Animal corpse physics is now synced between clients. Improved splitting items by offering specific values to split. Stockpile graphics have been altered so you can now see if there is a hole below. Currency drop downs are now sorted by backed currencies first, then by amount of currency in circulation. Improved behavior of item selection when left-clicking a storage with a tool in your hands. Improved the hammer tool to not cause any more unintended item removals from storages. Added /spawnsewage and /raisesealevel developer commands. Added /spawn command that accepts different parameters to spawn automatically claimed buildings with a specified world object inside. Added animation randomization scripts to the modkit. Added ability to set initial server ID with command line argument (--serverId) or environment variable (ECO_SERVER_ID). Added display of progress when loading mods instead of just hanging on the “Loading …” message. Added error handling for local server connections. Dropdown lists now automatically close after leaving them. /setreputation can now skip value clamping. Admins can now be specified by username which allows to grant admin rights before a user logged in. Usernames that could resemble a slg or steam id are now prevented. Chat commands now both accept the English and localized names. Empty data files are now treated as corrupted and will start restoration from a backup, if available. Slight optimizations in bandwidth for the web interface have been made. Improved shutdown logic for Windows and especially Linux servers. The server now catches SIGTERM and SIGINT signals and tries to gracefully shutdown. Improved the dev-tool to be able to destroy everything. Extended the drag zones for items – no more item drag reverts. Added shift modifier to dragging items, you can now drag all items of the dragged type anywhere you want. Species and World Layer settings are now defined in the mods directory, making it easier to release simulation mods. 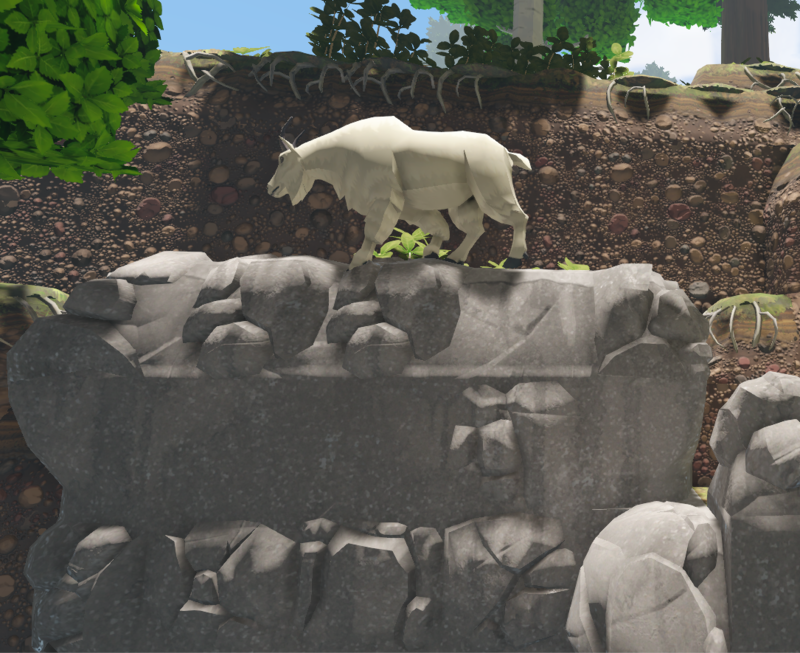 Improved physics performance of animals. Improved connection logic for the server started from client, it is now less likely that it will hang on startup. Single player servers now start in the same language as the launching client. Chat commands were added to the localization system. Disabled the possibility to click on main menu buttons until it is visible to the player. The meteor intro screen is no longer skipped if space or mouse button is pressed during the end of a scene. 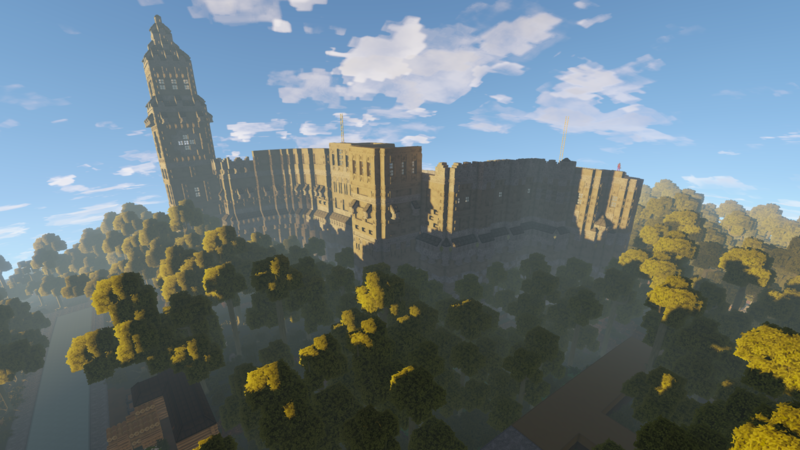 Added volumetric fog graphics option using Aura. Added quality slider for global illumination. 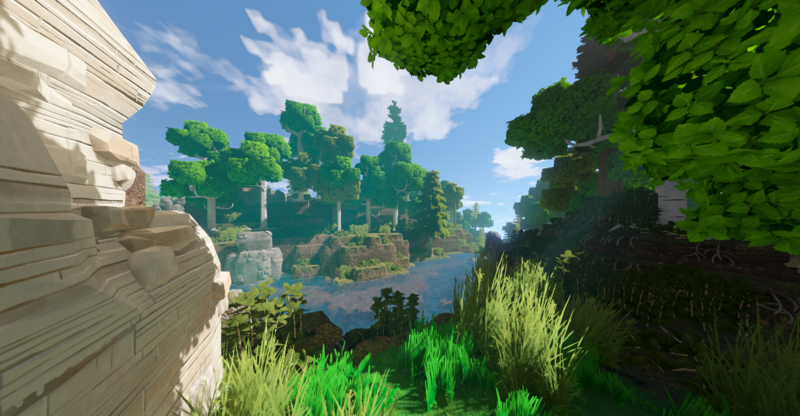 Tweaked foliage LOD settings, can set all the way up to 200% quality if desired. 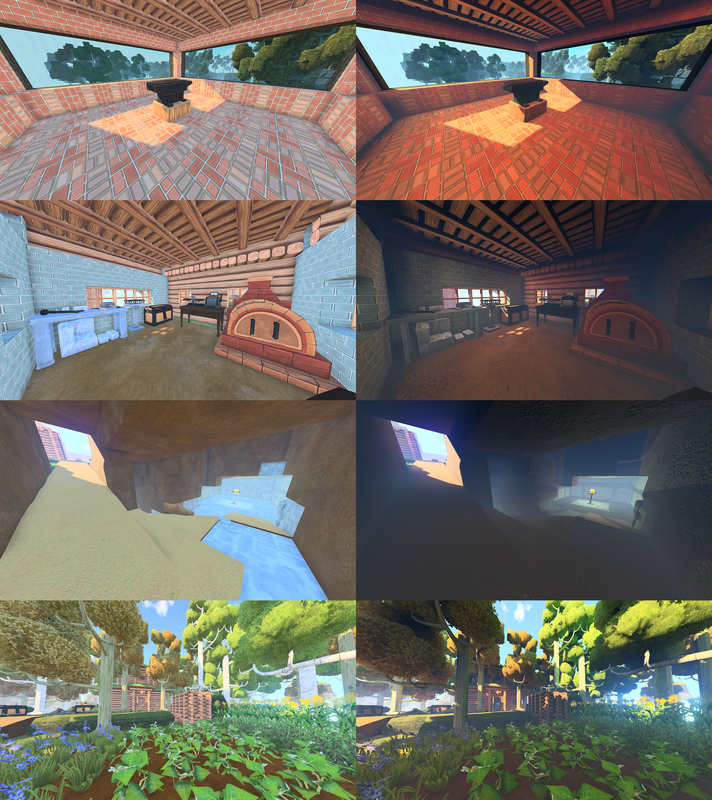 Improved performance of global illumination and reflections; These effects will update less frequently, but at a dramatic improvement in performance. Added tier display to items, if they have a tier attribute. Added extra seed recipes to the Farmer’s Table for all new plants. Added seed recipes for Amanita Mushrooms. Added minimap store location display in the economy tracker. Added housing category color to housing tooltip. Added batch selection to stores. Added title to the minimap UI. Added a delay for “has for sale” messages to prevent spam. Added an “All” button to UIs with an input amount. Added a description to the chainsaw that is used instead of the description of the axe. 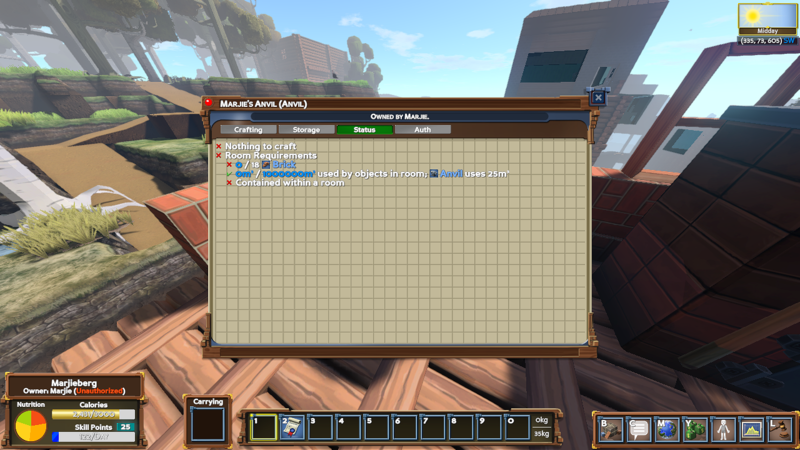 Added quick item transfer between inventories using mouseclick and shortcuts. Added automatic quantity capping on item transfer. Added the possibility to set the worlds default currency by the leader in the treasury. Added the bank account balance of a storeowner to the economy viewer. Added the possibility to see if you are authorized to use a shop in the economy viewer. Added an elevator call post to control the elevator remotely. Added the possibility to charge fees to the repair station. Added a popup when trying to open the skill ui without finishing or skipping the needed tutorial first. Added an “transaction successful” popup for bank transfers and payback of debts. Players now move slightly faster on roads. Most higher tier food recipes now require lower-tier food recipes to be crafted. 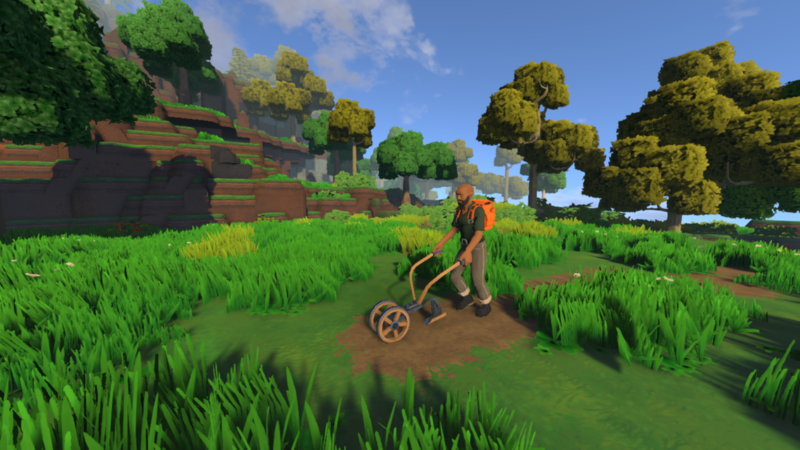 The areas in which farming is suitable have been drastically expanded. For example, tomatoes now may survive in almost all 'grassland' areas as opposed to only smaller areas of those biomes. Left clicking on a storage with an empty selected toolbar slot will fill it with the first item in the storage. 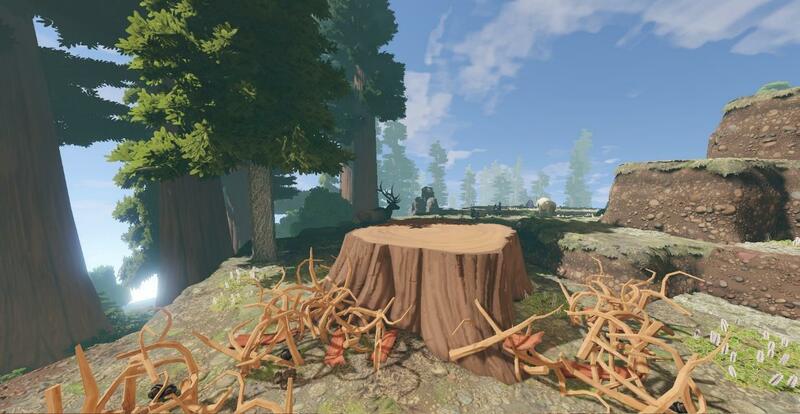 Tree debris is now dependent on the tree species and slows you down. Seeds for all tree types except cactus are now acquired from the debris rather than whacking branches. Almost all object and item crafting recipes had their costs increased. (From very slight adjustments to almost double, depending on the recipe) to account for the new skill system granting 50% efficiency immediately when choosing a specialty. Removed the storage tab from some objects that didn’t need them. 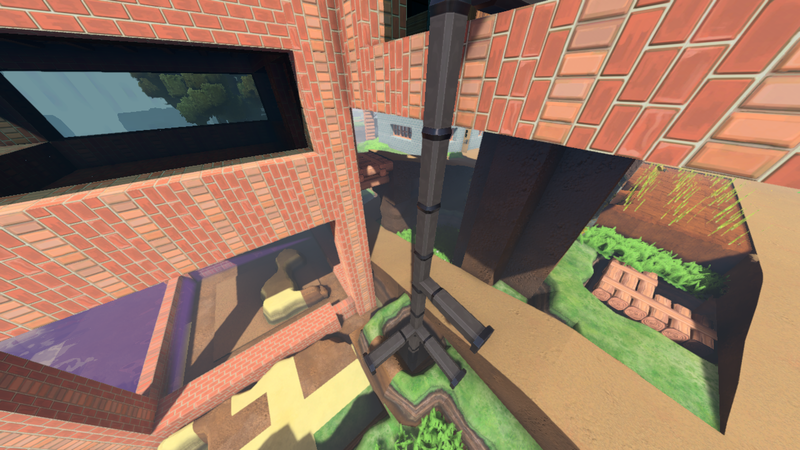 Pipes are no longer considered walls and thus do not affect room score or count as structure. 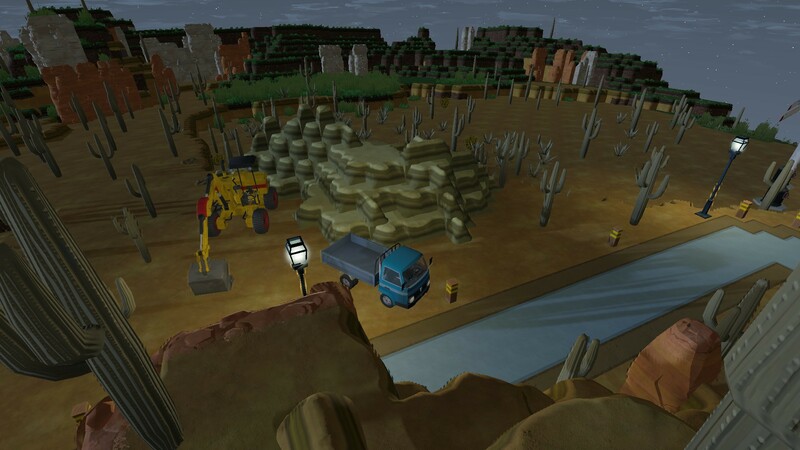 Plants now impede vehicle movement, construction vehicles are unaffected. Plant sounds are now played for animals, other players and vehicles. This should help moving entities feel more present in the world and finding animals hiding in dense vegetation. The tooltip for room tier will now differentiate between constructed blocks and stacked blocks. The computer lab will now show a message if there is not enough power available to run the lasers and disable them when they run out of power while active. Treasury will no longer show currency if there is none of it in the treasury. Tweaked treasury currencies update times, it now shows more recent information. Tutorial tasks that have been completed before opening the tutorial will be completed when the tutorial is opened. Removed selecting land claim papers subtask in the tutorials. This list includes all notable bugfixes since the start of development for 8.0. Fixed transferring of multiple stacks into the inventory. Fixed strange behavior of the shelf cabinet. Fixed multiple issues with nested contracts that have multiple sub-clauses. Fixed an exploit related to contracts. Fixed a bug that allowed players to change store listings without proper access. Fixed some issues with the housing bar. Fixed calories in the stomach triggering the foraging tutorial. Fixed repair station titles and mechanics. Fixed forgive mechanics for debts. Fixed loans and bonds targeting the wrong account. Fixed an issue that caused the web ui to randomly not show water in the map. Fixed a problem that caused random server names to appear on the continue button and in some cases connecting to the wrong server. Fixed some issues with the UI of the real estate table. /testtreasury now works as intended. Fixed adding new entries to authorization. Adjusted the height offset for checking if grass is below a certain level, fixing the mow contracts. The contract board will no longer show “bucks” in some of its dropdown lists. Prevented the server from crashing after setting the World Leader as an authorized user. Fixed loans not saving their currency on server restarts. Fixed some bugs with debts and contracts. Fixed an issue related to discord hyperlinks and them not showing in the server browser. Fixed players getting their crafting fees waived for orders when they should be paying the fee. Fixed arrow disappearing in choose world screen. Fixed treasury currency dropdown, it’s now dynamic and adapts to window size. Fixed treasury button margins for better localized text support. Fixed /allplants to work again. 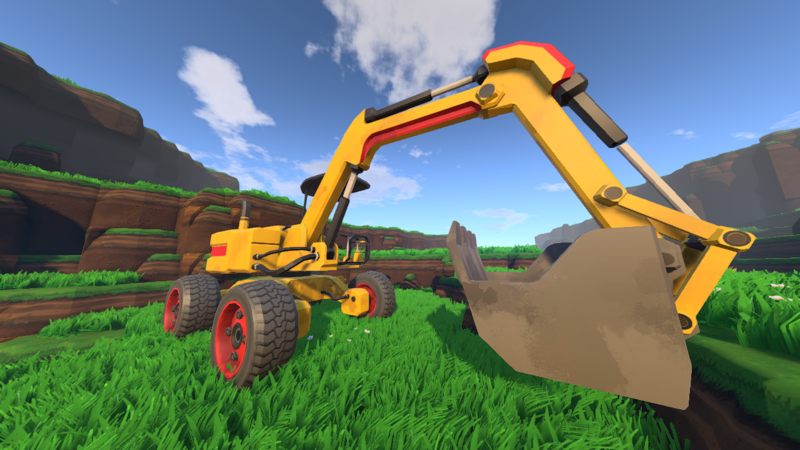 Fixed accidental block placing with shovel, for example when the storage is full when trying to put the carried item into it. Fixed the local server to be unable to be started from the client. Fixed skill benefits rounding with server-side only calculations. Fixed treasury buttons spacing for localized names. Fixed a bug that caused icons to eventually become offset when being dragged around. Fixed orange color in tooltips. Fixed storage interaction errors when the storage is full. Fixed position of the food status UI tooltip. Fixed hitboxes of status bar tooltips. Fixed blocks attempting to connect to the wooden elevator. The elevators ‘doorway’ for sealing rooms is now below the elevator and you must have an empty space there when placing it. Fixed a strange behavior for law buttons to sometimes cause to scroll instead of their intended action. Fixed wrong bank account funds numbers in direct transfer dialog. Fixed target bank account name not shown in direct transfers. Fixed an issue that caused completed tutorials to not show up in the tutorial list. Fixed the escape menu to no longer show the wrong default selected tab. Fixed item selection in the toolbar. Fixed digging and mining tutorials. Fixed picking up carried items with left click. Fixed sorting in the economy viewer, it now sorts by the localized name instead of the english name. Fixed graphics tab layout and sliders in the escape menu, allowing them to dynamically scale for bigger localized text. Fixed /give command, it now behaves more like usual inventory transfers. Fixed cranes no longer showing their interface and being unusable. Fixed showing of error messages in the Web UI in cases of a server error. Fixed the chat to jump to a wrong position when opening. Fixed a bug that caused the animal populations reset to max population on a server restart. Fixed scrolling in the server browser. Fixed distribution station tracker for remaining items to update correctly. 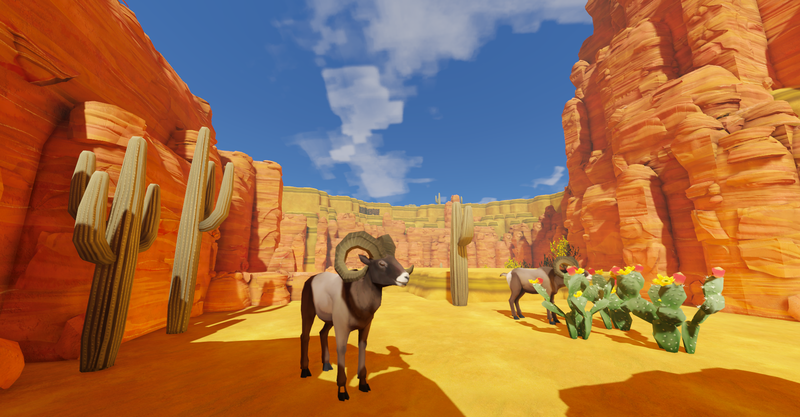 Fixed third person camera behaving oddly near large plants. Fixed wrong name in work orders being passed to the localizer. Fixed “Array out of Bounds” Exception in /creative command. Fixed distribution station caused breaks. Fixed double connection error message. Fixed editing of bank accounts. Fixed exception on the removal of bank accounts. Fixed a problem that lead to the server not being added to the recent servers when joining through direct connect. Fixed crash when placing a starter camp. Fixed being stuck at the connection UI. Fixed an issue when reconnecting to servers. Fixed a crash on shift-clicking empty slots. Fixed strange behavior when setting tax percentages in the treasury. Pinned “Make a transfer” button outside of the scroll area. Fixed the layout of the housing tutorial. Fixed a rare issue that could happen when multiple players tried to pickup the same world object. Fixed hunting not leveling up properly. Fixed several issues with tier requirements on various tables. Fixed buggy line in the header of the crafting UI. Fixed the name parsing of the leader in the treasury. Fixed an issue that allowed other players than the leader to change the worlds default currency. Fixed star glow effect appearing on level up and points changes. Fixed frame-rate degradation after closing crafting UIs. Fixed skill notification window layout. Fixed adding double rows in currency exchange offers. Fixed ping to server behind a NAT. Next up for the developers is a focus on performance and polish in Eco 8.1, which will arrive in March (date TBD). After that is Eco 9.0, the Laws and Government update, which will add constitutions to the game and many other new features. Look forward to more details on that to come. And next week I’ll be describing our long-term goals and plans in an article ‘The Eco Movement’. Fixed issue with vehicles and players sometimes become invisible. Make Real Estate Desk working again! graceful shutdown for Windows servers. If you close it (Alt+F4 or with close button) then it will try to save state (Windows will only provide 5-10 seconds for that) or you can configure your software to send Ctrl+C to console app and configure own timeout for shutdown. the Big Eco Game community event with Jeff Grubb and friends started this night. They're playing through Eco 8.0 all month long with 70+ players and three major factions! With default settings it will keep hourly backups for last 24 hours, daily backups for last 3 days, weekly backups for last 10 weeks. Default backup frequency changed to 0.5. 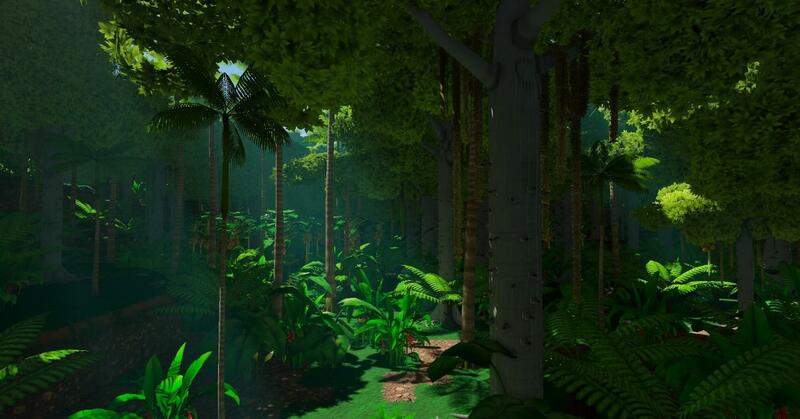 Eco 8.0 - the BIOMES Update - will be released on our 1 year steam anniversary on February 6th! A New Skill System! - Earn levelups by doing work, then choose specialty talents. A New Animal AI system! - Animals have new behaviors and are much smarter. Pipes! - Create plumbing networks to supply your villages and remove pollution. Banks! - Create new bank accounts and designate who has access. Registrars! - Create titles and use them to determine who can access what. and many more (performance) improvements and bugfixes! We'll be showing off these features and answer player questions in our livestream this Friday at 2pm PST / 23:00h CET, come in and say hi! The language lock option in the settings has been removed. The language filter by default is only enabled if you play the game in english. The "Your Worlds" menu is now available from the beginning, without the need to start a new game first. This enables players to use direct connection and lan servers right from the start. The CO² feature works correctly again. Servers with long descriptions now appear correctly on the "Recommended" tab and in the server search results. A timeout has been added to direct connections and the error message "Invalid IP Address" for valid connections was removed. The stability of world saves has been improved, it is now less likely that they get corruped during writing to disk. World saves should no longer become corrupted because of too long paths inside them. Also, some optimisations for legislation checking and the user login were implemented. Added a new Distribution Station object. 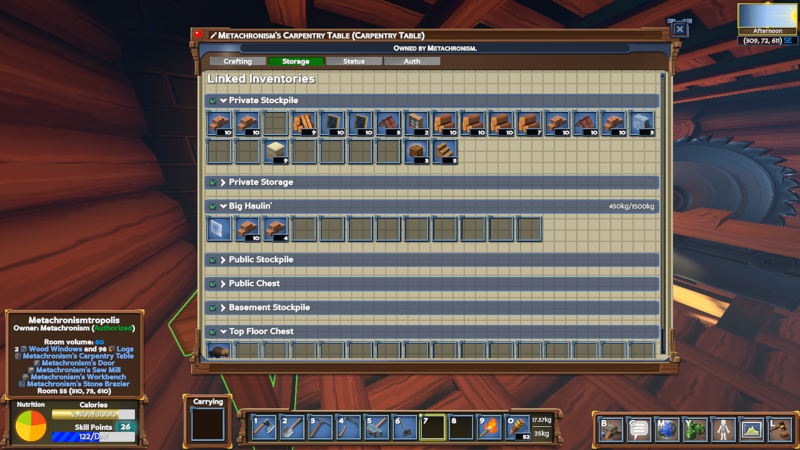 This is a stockpile where the owner can set a ration of items that every new player can take, which they will be notified of with a World Marker when they enter the game. With this object, citizens and governments can set up items to provide to new players to help them get started/catch up. You'll also be able to see the items provided from the Server Browser. You can set the max 'age' of a player for them to be eligible for items. The camp comes with a small stockpile and contains starting supplies. The camp also serves as a crafting table that can craft a limited selection of things. 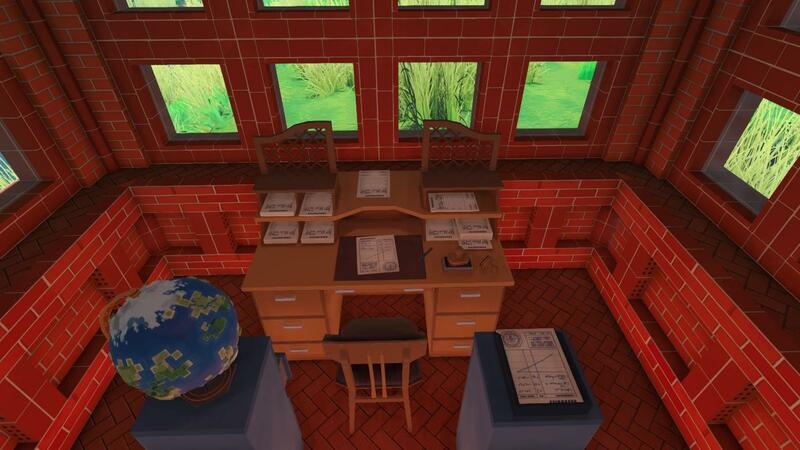 At the desk, you can examine your deeds, edit their settings, move land and vehicles between deeds, create and delete deeds, and unclaim land and vehicles. You can also buy and sell deeds. Deeds are no longer items that you can carry in your inventory. Replaced "Property Claim Flags" with a "Land Claim Stake" tool and "Land Claim Papers". The Land Claim Stake works similarly to how claim flags used to work - hold it and right click to claim some land. It also has some new features. You can hold it and left click on claimed land to unclaim it. You can also target claimed land with it and press 'E' to open the deed window for that land. The Land Claim Stake uses Land Claim Papers. Each paper represents your right to claim 1 plot of land. Unlocking skills will grant you Land Claim Papers, in the same way it used to grant you Property Claim Flags previously. When you claim land with the Land Claim Stake, the deed that the land is attached to is no longer determined by the deed in your inventory (since you can't have deeds in your inventory). Rather, it is determined by the deeds of nearby plots belonging to you, and . If there are none within range, a new deed is created. The treatment of vehicles versus stationary objects with regards to deeds and authorization has been unified, and the 'Auth' tab of the object window - which has been renamed to the 'Authorization' tab and given an overhaul to improve both clarity and appearance - will appear for both. No more 'Lock' toggle for vehicles - they now have full authorization settings support just like stationary objects (that is, the ability to set them to public, whitelist, or inherit from deed mode). 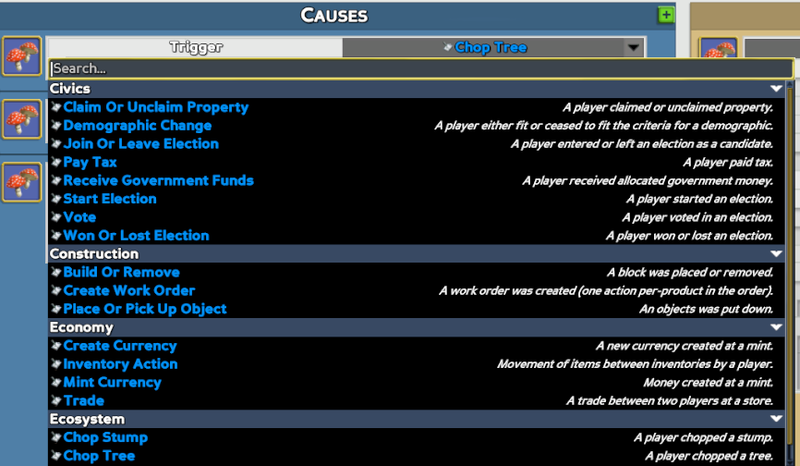 Added an "Unclaim Property" action to stats, which can be referenced in laws. The Robotic Assembly Line is used to craft all internal combustion engine vehicles and other advanced machinery. Added calculated exchange rates. Eco will now compare trades of the same item in different currencies to make a rough exchange rate, which can be used by citizens to help understand prices (how to shop and how to set prices). The inner details of how they're calculated is displayed as well, so players can make informed decisions. You can view this in a currency’s ‘Currency Report’. Will be doing more with this exchange rate later. Added intro sequences for food and housing, explaining the concepts with icons and animations. Made it easier to exit water in a few situations like 1 block thick docks. Third person mode in vehicles now zooms out further and behaves more consistently. Vehicles with tools now attempt to dump into multiple inventories for objects that have multiple inventories. Eliminated performance impact of using world markers. Added a key binding to toggle 3rd person (defaults to F5). Changed the nutrient values of almost everything, generally a ~20% increase. Nutrient values now scale more aggressively with higher tier food. Recipe costs changed due to recent farming/collection changes. Removed Campfire Cooking skill - the recipes are now available to everyone. Old Campfire Cooking recipes ingredients have been modified due to no efficiency/speed skills. Removed Basic Crafting skill - the recipes are now available to everyone. Basic Crafting recipes ingredients have been modified due to no efficiency/speed skills. Players now start with reduced land claims and a camp item. Most plants now give less resources. Added seed recipe for mushrooms. Gathered seeds no longer increase with gathering skill. Blast furnaces once again produce tailings. Blast furnaces are now harder to make. Lots of miscellaneous changes to late game recipes. Ingots (all kinds) are more expensive, other recipe costs reduced where appropriate. Steel now requires coal or charcoal to smelt. Fixed an issue where a vehicle with both a fuel supply and storage would behave inconsistently in the linked inventory UI. 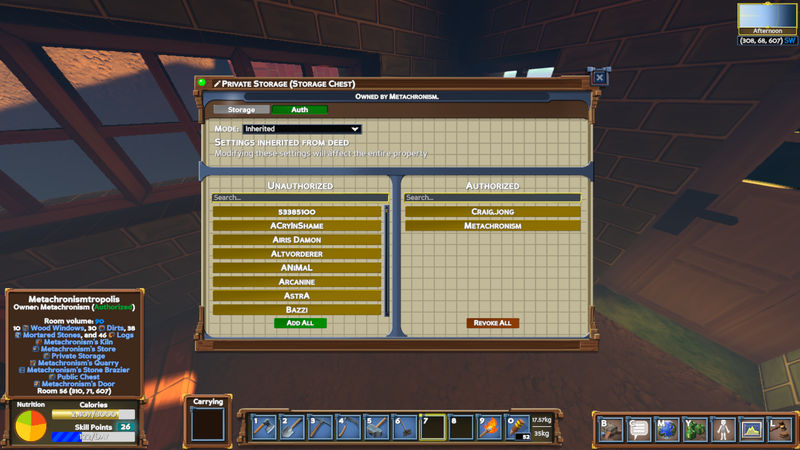 (The UI displayed the fuel supply and the storage as separate inventories with separate settings, but the server treated both inventories as sharing the same settings. 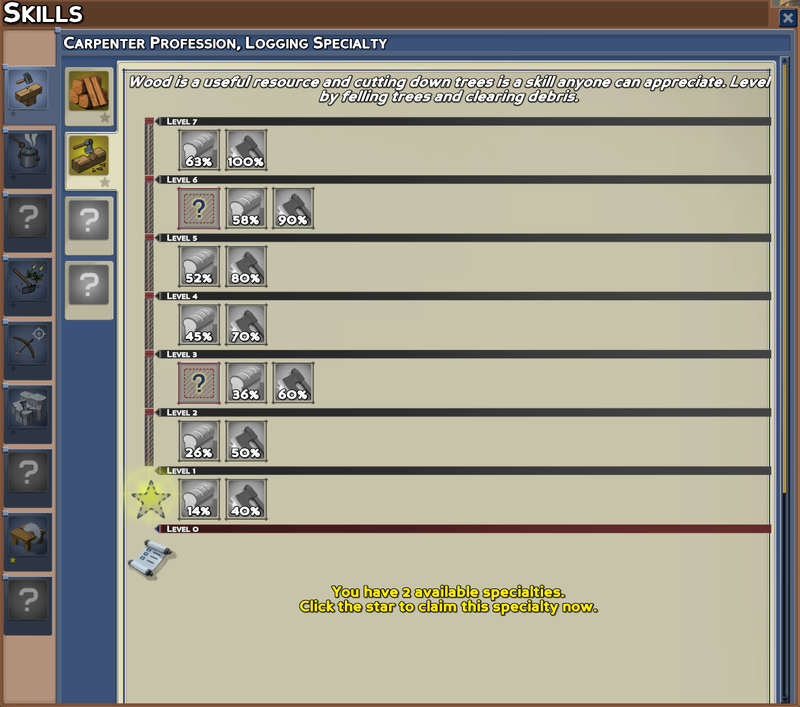 Now the server also treats them as separate inventories). Fixed the fishing line not meeting with the lure correctly. When attempting to join a server by ip address, if you enter an invalid ip, it will now show an error message instead of attempting to connect forever. Single-player server will now close itself if the client crashes. Added Elevator for transporting materials and carts vertically! Added stone, hewn log, and lumber door recipes. Added cranes! Players can use the crane to build large walls in one click by targeting the corners with the claw. Fixed an issue where server passwords were being double-encrypted on server startup. Server passwords will now show in plain text in the server window but are still encrypted when sent between client and server. Existing server passwords will need to be reset to the desired value. Fixed a bug in client-side predictions that sometimes made blocks appear, disappear then reappear in your carried slot. A large part of the networking code has been overhauled for this release. The server now uses UDP on port 3000 for game traffic by default, and TCP on port 3001 for web traffic by default. If you were forwarding ports to your dedicated servers in the past, you will need to update your rules accordingly, including any rules in firewall programs. In most instances, you should no longer need to port forward when hosting a server. We'd recommend using the steam friends "join game" feature to easily join each other games, instead of needing to find IP address and connect manually. New layout and visual style. 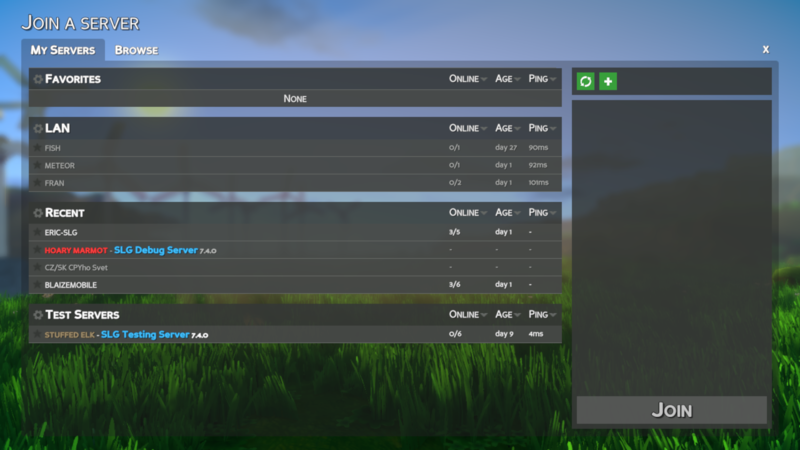 Among other things, the new layout allows many more servers to fit on screen. This screen has been split into 2 tabs - one for only the servers that you are most likely to join (for example, your favorites, LAN servers, and official SLG servers), and the other for browsing for a new server. This allows you to view the first tab without having to query all the servers, which is more expensive. Added a new category on the server browser for 'Test Servers', which for now will link only the official SLG test server for the next version. Players will need to switch to staging to join this build, and a popup will inform them of that if they attempt. 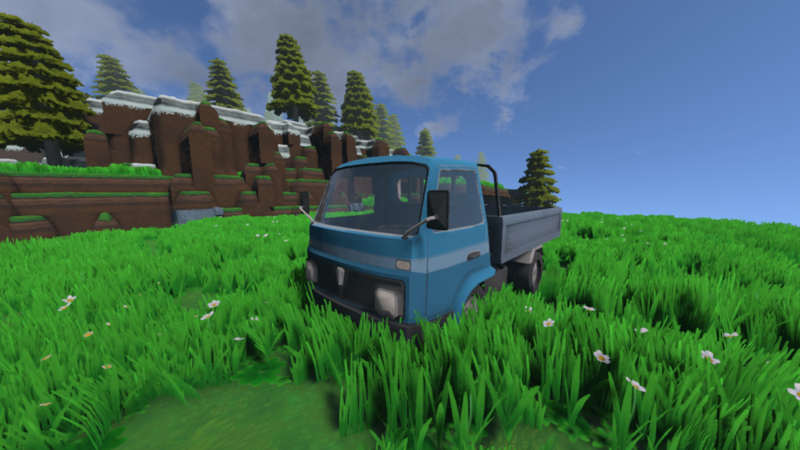 Added a modern pickup Truck! Added hewn log, lumber, and stone signs for both standing and hanging. You can no longer consume food when full. Candle Stands no longer require solid ground. Zero and low population plants will now be force spawned into worlds without them. After activating the meteor destruct sequence, removing lasers or generators or otherwise breaking the laser setup will now cancel the destruct sequence. Servers with several thousand world objects should notice fewer cases where world objects seem unresponsive. We are now tracking which world objects need to be saved and saving is distributed over time. Saving during shutdown is much faster. Added proper detection and handling of save-game corruption. If a save is corrupt upon starting, it will restore the most recent backup. If a save is corrupt mid-game, it will delete it and resave everything. Made the server start auto-backups by default. Spaced out backups. Now there are by default 6 made for the last hour, 10 for the last day, -7 for the last week, and up to 100 weekly backups. These numbers are configurable in the backup plugin. Made any server errors that are logged also send to all admins via chat. Fixed an exception thrown when a mod overrides PlayerDefaults.GetDefaultSkills to be empty. Show a better stack trace in the tooltip if the tooltip errors out. Blacklisted a few characters from usernames, which caused people not to be able to use chat. Namely '<' and '>'. These will now be automatically replaced with '?' the first time a player signs in to a server. Fixed a bug that sometimes made you press interact twice when reopening a world object UI. Disabled the unfocused fps limiter, it didn't work properly when vsync was enabled. Users can now copy the log file easily when an error occurs. Log file will also be attached when bugs are reported. Disabled single player new/load buttons for osx & linux. Made Skills UI Show All toggle not invisibly take up the whole bottom bar. - Plants overlapping with constructed blocks now get destroyed during initialization. 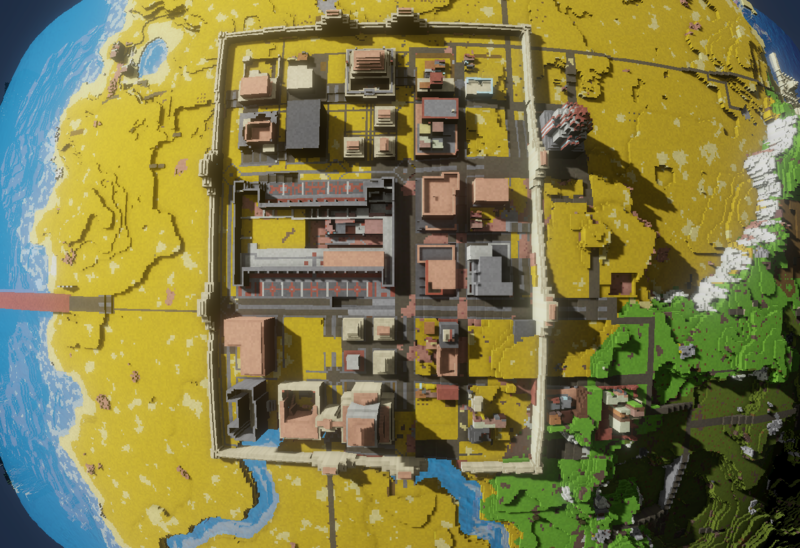 - Fixed lasers lagging servers that have lots of world objects. - Fixed valid laws getting incorrectly removed on server startup. - Fixed incorrect 'not authorized' errors on stores. Additional options for a variety of graphic effects has been added to the escape menu. Here you can disable/enable features to your liking, or disable expensive options to improve your framerate. Shadow quality for interiors and in caves has been improved. A realtime reflections option has been added. This has a minor effect on performance, but can greatly increase the look of metallic objects in the world. 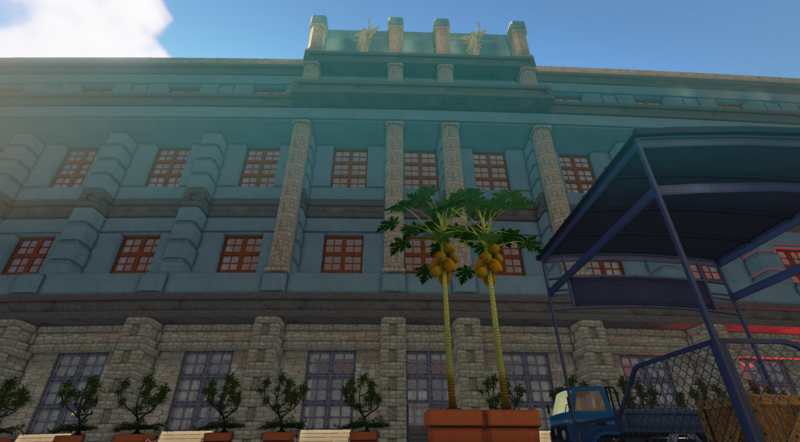 A new experimental lighting model for global illumination has been added. This is a relatively expensive effect but should run well on most modern video cards. Global Illumination models indirect lighting that bounces off other surfaces. This effect makes caves naturally dark, so bring a torch! How items are stored and managed has been significantly changed. Craft tables no longer have intrinsic storage on them; instead, large objects must be stored in stockpiles or vehicles, and other items can be stored in chests. Crafting tables automatically are ‘linked’ to storage objects nearby, allowing them to both take from and deposit their items. 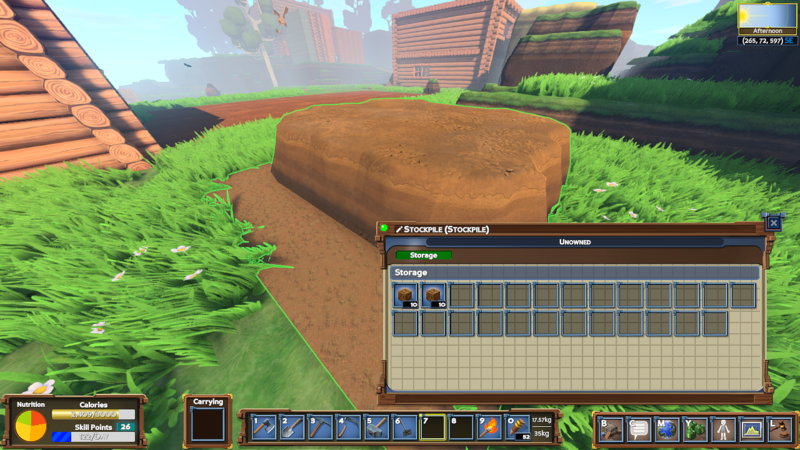 Large items such as dirt, logs, and stone can no longer be stored in chests, but can be stored in a new stockpile object. Stockpiles require a 5x5x5 area of the world. Secondary effects from some block types (such as tailings) will occur, so be mindful of where you are storing your refuse! The authorization system has been improved; allowing easier control over who has access to various things that you own. You can lockout everyone from a private chest, while allowing people access to another, for example. 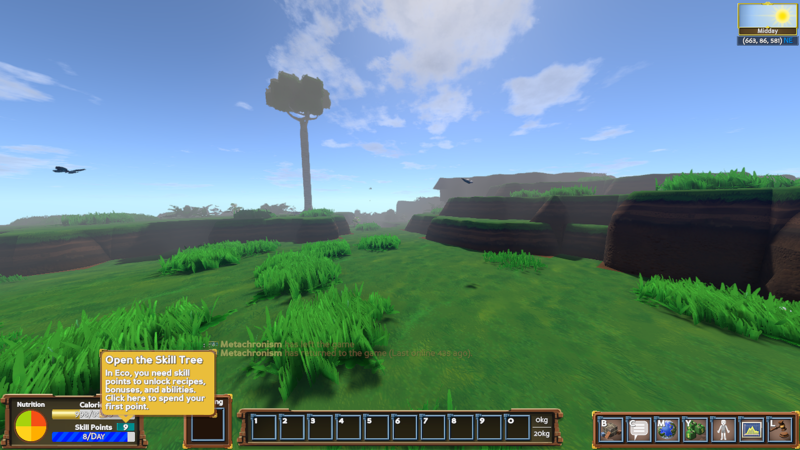 A tutorial has been added to Eco, helping new players get a feel for the early game. Existing players may not see much of the tutorial, since it attempts to detect what you’ve already done and skips those. Some craft tables need pipe outputs in order to spew hazardous materials from. Chimneys work similarly now. Room requirements are now broken out by line item requirement, and the status is displayed for debugging why a table may not be functioning. Modkit now auto-loads managed DLLs from the Mods folder. Modders can implement IModKitPlugin to add their own mods. Tutorials can be expected soon, but it is now possible to build asset bundles for client side mods. PM or ask in the modding discord channel for some basic help if you want to get started on this early. Over 400 bugs fixed since last release! Due to considerable changes to inventories, if you are migrating from a 5.5.4 save, all items in crafting tables WILL BE LOST. It is highly recommended to start fresh, but otherwise you should have no other problems using an old save.